Add Shift: You can enter in your shift settings by clicking on the Add shift button within the 'Manage Shifts' screen. An unlimited number of shifts can be defined for a location. A given schedule cannot contain more than 64 unique shifts. 1.Shift Name: Enter in a name for your shift. Each shift name can be up to 13 characters in length. 2.Short Name: Enter in an abbreviation for the 'Short Name'. It allows you to decide which 10 letter abbreviation to use for each shift. 3. Site: If you selected a separate site within the drop down menu the shift is added to the site. It displays the abbreviation for the site that you selected for each site within the 'Manage Shifts' screen. (If you did not divide your current scheduling location into separate sites you will not see this drop down menu displayed.) Each shift needs to be assigned to the site where it should be printed. 6. Call or Backup shift: 'Backup' and 'Call' are special names. Select the check box if this shift is considered an on call shift. Exclude from shift statistics: Enable to 'exclude the shift from the statistics' in the cumulative summary. 7. Duration: A 9:00 a.m. to 5:00 p.m. shift would be 8 hours in length, automatically calculated to the nearest Â½ hour from the Start and End times values. The 'Duration' will automatically update after entering in the 'Start' and 'End' times for the shift. 8, 9, and 10. Weekend Shift If On Friday...Saturdayâ€¦Sunday: If a provider works a particular shift on a Friday, Saturday or Sunday, should he or she be credited with working a weekend shift? Select the check box that applies for Weekend if on Friday, Weekend if on Saturday, and Weekend if on Sunday. 11. Priority: Rank shifts by their scheduling importance. 12. Shift off prior to a day off: Before creating an individual schedule, it gives you the option of indicating which shifts each provider wants off (i.e., has requested not to work due to vacations or other obligations.). 13. Active: This field will have a default of 'YES'. 14. Always require administrative approval when the shift is involved in schedule change proposals: (Optional) Shifts can be configured such that any schedule change proposal involving the shifts requires administrative approval before taking effect. 15. Default bonus pay: (Optional) If the 'We provide bonus pay for hard to fill shifts' setting is enabled in the 'Payroll Configuration' screen. This option will show at the level of a shift or 'Edit hours or assignment'. 16. Exclude from payroll: (Optional) If the 'Payroll Configuration' screen is enabled. This option will show at the level of a shift to exclude from 'Payroll'. Shifts can be excluded from the payroll. No pay is computed for such shifts. 17. Assignment is sensitive to provider speed: Shift can be included or excluded from being considered as speed sensitive in the shift edit screen. WARNING: Updating the shift start & end times only applies to future schedules. 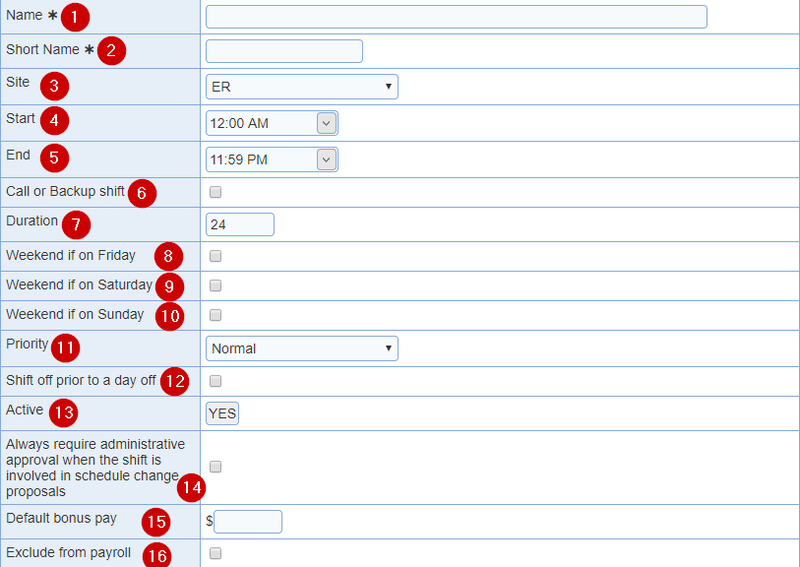 In an 'existing version', use the 'Change Shifts' tool to update the shift time.